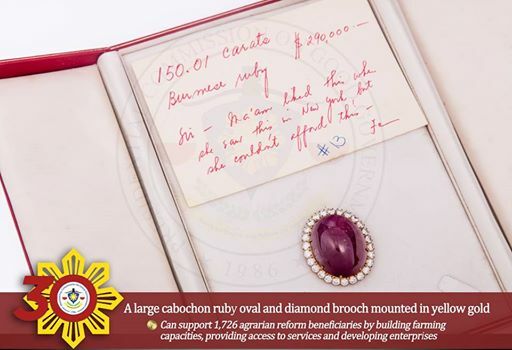 MANILA, Philippines – What is the value of a ruby that was once owned by Imelda Marcos? Approximately 52,000 textbooks, according to the anti-corruption agency Presidential Commission on Good Government (PCGG). 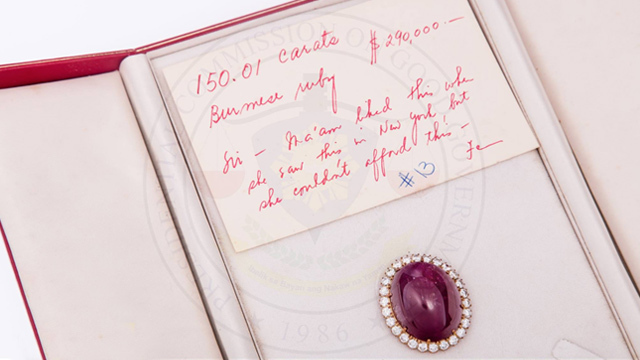 The PCGG recently published a photo album of Imelda’s jewels, a part of a collection sequestered by government because the wife of the late dictator Ferdinand Marcos purchased them using ill-gotten wealth. The photos showed equivalent social services that the money paid for the jewels could have purchased to serve the public instead. 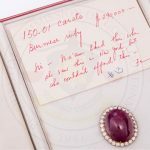 A 25-30 carat heart-shaped cabochon ruby could pay for 52,631 grade 11 and 12 textbooks, according to PCGG estimates. These books are in short supply in remote parts of the Philippines. Last year, a call was put out to donate textbooks to Mindanao State University after a Facebook post suggested biology and agronomy were being taught with 1950s textbooks. A black sapphire brooch, a ring, and earrings that were set in white gold were estimated to be worth the equivalent of 12,400 seedlings for forestry projects. 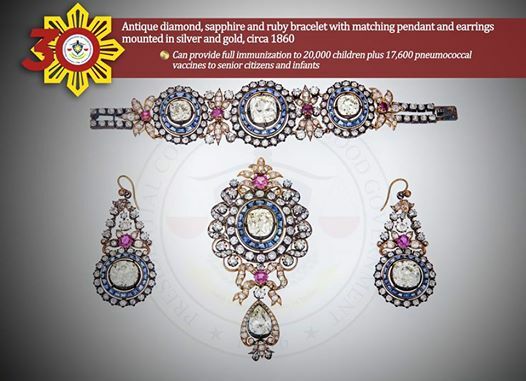 A set of antique diamond, sapphire and ruby bracelet, pendant, and earrings mounted in silver and gold were also estimated to be worth the full immunization of 20,000 children and pay for the purchase of 17,600 pneumococcal vaccines to senior citizens and infants, according to PCGG. Pneumonia is the second leading cause of infant mortality accounting for 2,628 deaths, according to Philippines Health statistics. Among adults, it is the fourth highest cause of death according to the Department of Health. There is also a campaign underway to reduce the cost of the vaccine from $45 to $5 which could make Imelda’s jewels’ value stretch even further. 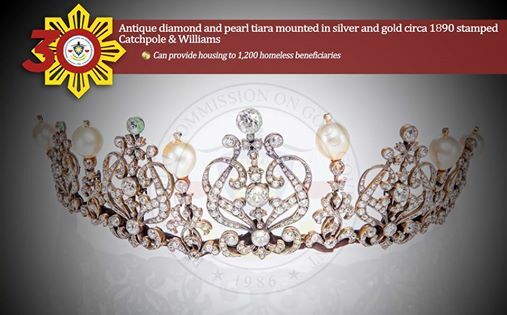 A diamond and pearl tiara also holds enough value to house 1,200 homeless. It is estimated that a quarter of Metro Manila residents are homeless, according to 2014 figures. 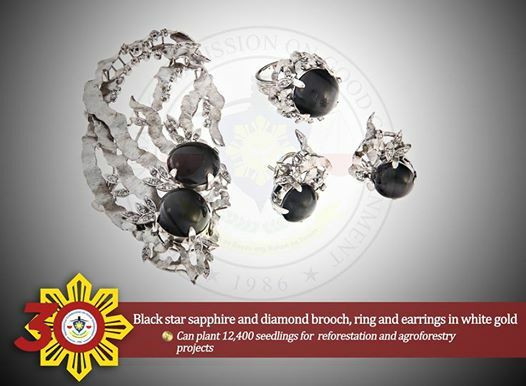 The jewels were recovered from the Marcoses in 1986 after the popular People Power uprising that toppled the Marcos administration. Their combined value has been estimated at P1 billion (USD21 million). The posts came at a time when surveys show that Imelda’s son, vice presidential candidate Ferdinand “Bongbong” Marcos Jr, is in a statistical tie with Liberal Party candidate Leni Robredo. Critics hit the timing of the release of photos, saying the PCGG is playing politics during the campaign season.